We have had one of the most beautiful weeks weather-wise that I can remember since we moved here, with blue skies every day and balmy temperatures (well, yesterday was quite humid, but it was still beautiful), and I’ve gotten to experience it all through the window of my bedroom or the living room, thanks to my continuing back issues. It had been getting better, and the pain had settled into on area on one side of my lower back. I was able to get out and go to the farmers’ market on Wednesday, and a trip to Costco on Thursday went pretty well, although I had to lie down for a while again as soon as we got home. I picked up a package of Salon Pas while we were out, and wearing one of those helped quite a bit, or at least let me get up and walk around a bit more. All was well on Friday and yesterday morning, and then in the afternoon I stood and chopped some onions and celery for less than 10 minutes and now my back is worse than ever. Why? I will be spending the day in bed again, and calling the doctor tomorrow morning because this has been going on for too long. 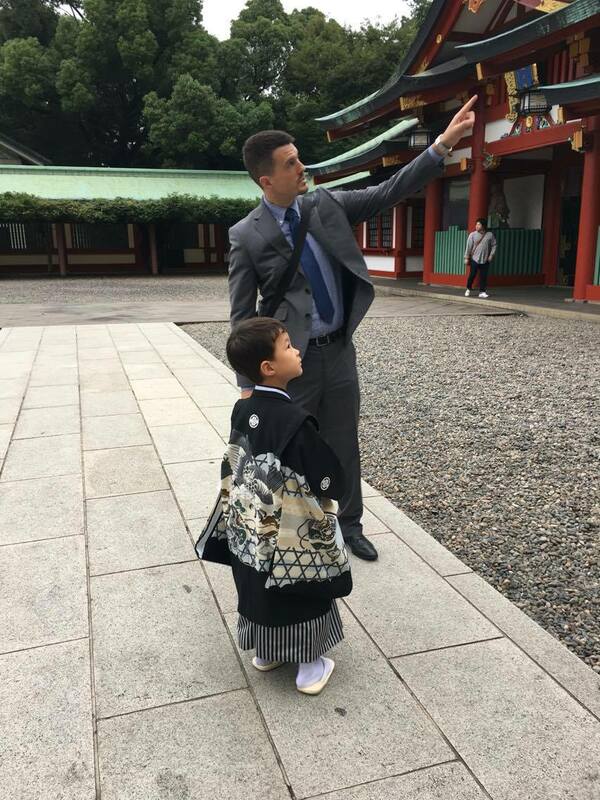 Our grandson celebrated his Shichi-Go-San (7-5-3) ceremony on Saturday in Japan. It’s not a national holiday, but a traditional rite of passage ceremony for three- and seven-year-old girls, and five-year-old boys. The children and parents visit their local shrine to drive out any evil spirits and make wishes for a long, happy life. The ceremony is also the first time for most children to wear traditional formal clothing (hakama for boys; kimono for girls, with seven-year-old girls wearing an obi for the first time). Children are traditionally given chitose ami, long pieces of stick candy, in bags that are often decorated with cranes and turtles, symbolizing long life. The hunt for flights over to Japan next March has begun in earnest, but so far fares are still a bit more than we want to pay so we’re holding back and staying patient. There were some terrific fares for a couple of days after I got back home at the end of last month, but neither Brett nor I was feeling motivated enough to buy anything then. We also sort of got ourselves hung up on holding out for Hawaiian Airlines in order to accumulate more FF miles, but then realized it would end up costing us more because we would have to fly in a day earlier than planned and pay for a hotel for one night – the Hawaiian flights arrive in Tokyo too late for us get to the Sanno Hotel on time (if we are not checked in by 10:00 p.m. on the first day we lose our entire reservation). So, unless Hawaiian suddenly offers some amazing fares, we’ll be flying with another carrier. I feel confident we’ll find something within the next few weeks. Reading: I finished The Man In the Rockefeller Suit mid-week and started Between You and Me: Confessions of a Comma Queen, by Mary Norris, who has worked for over 30 years in the copy department of The New Yorker. I taught English grammar for years, from basic to advanced, and Norris makes the topic of grammar (and the job of editing) fun, irreverent, interesting and helpful, even if you think you have English all figured out. Listening to: It’s very quiet around here this morning other than the sound of the ceiling fan overhead, and a very assertive rooster out in the backyard. Brett is doing something in the kitchen, and YaYu is studying in her room. I really do not want to be back here in my bedroom all day, but I need to help my back feel better. Watching: I didn’t watch any TV most of week; we don’t have a TV in the bedroom, and it’s been too uncomfortable to sit or lie out on the sofa in the living room. I finished The People vs. O.J. Simpson yesterday evening, and Brett and I started watching Penny Dreadful, a fantasy/horror/mystery series set in Victorian London that’s available on Netflix. We’re hooked. Tonight though the three of us are going to watch Zootopia, also on Netflix. Cooking/baking: Brett got the balsamic pork roast started the slow cooker, but I made the vegan stuffing in the slow cooker yesterday and will reheat it for our dinner tonight. I was going to steam some petite peas to go with the pork and stuffing, but we picked up a lovely, big head of broccoli at the farmers’ market, so we’ll be having that instead. We bought a giant peach pie at Costco this week, so there will be no baking going on until it’s finished (which will take a while). Happy I accomplished last week: Just getting back to moving around again felt like a huge accomplishment even though it didn’t last. Otherwise I didn’t accomplish much of anything. Looking forward to next week: I hope to get things figured out with my back and start doing more again, including maybe going to the beach at least once and attending YaYu’s cross country meet next Friday afternoon, but that will all depend on how I’m feeling. On Tuesday I have an eye appointment and I will be going to that, pain or no pain. The exam is long overdue, and it’s finally time to say goodbye to the red frames that I’ve worn for the past three years. Since her cross country meet is on Friday afternoon instead of Saturday morning, we’re planning to take YaYu out on Saturday for breakfast at the Tip Top Cafe, and then we’ll all head over to Costco for a few more things on this month’s list that go on sale on Friday. Fingers crossed! Thinking of good things that happened: Our rent will not be going up next year! We had been starting to wonder as our lease renews in November, and we were feeling a bit nervous about it after our experience with our previous landlord last year, but our current landlord said no increases. He did warn us though that his taxes will be going up next year, and we may see a slight increase year after next. Brett was able to get out for a long hike last Tuesday, and we put $9.10 in the change/$1 bill jar. Grateful for: I’m feeling very thankful for how much Brett and YaYu have stepped up while I’ve been incapacitated by this stupid back pain. Brett has done most of the cooking, and done the dishes every day so I don’t have to stand at the sink, and YaYu has also helped out in the kitchen. Both will be helping me with the laundry today, especially since it was bending over to pick up the laundry basket last weekend that began this whole sorry mess this time. Bonus question: How are you doing with your holiday shopping? We’ll just have the three girls home this year for Christmas, so plan on keeping it fairly low key. Brett and I don’t exchange gifts, and while I haven’t actually purchased anything yet, I do have my list made, and between Swagbucks earning and savings, everything is covered. Each girl will be getting one “big” present and one smaller one, as well as their smaller stocking gifts. We’re just going to send a check to Japan this year for our grandchildren’s gifts as the cost of sending over a package has become too high – the postage alone is now usually twice as much as the value of the package, or more. I’ve also discovered a very fun activity that we’ll be playing on Christmas Eve. I think the girls will love it, and I’m hoping to make it a new tradition. I’ll post the details later. That’s what’s going on here at Casa Aloha this Sunday. How was your week? How are you feeling? What good things happened for you? What plans are you making? Ahh, I hope the doctor can help you. Back pain is the worst. Best of luck with improving the back! I can’t believe you’ve been in your house for almost a year! It seems like you just moved. But it’s been 8 months so nice we were there, so I guess I have to believe it. I hope you feel better soon! I know – the year has flown by. I’m so happy to be spending another year here – we really, really love this house and the neighborhood (well, except for the scary dog that visits in the middle of the night). We moved last November, but overlapped the month with the other house so we didn’t have to feel rushed about being out of the other house. The other landlord turned out to be such a jerk. As a person who had undiagnosed back pain. Be sure to insist on an x ray. Depending on what that show, be aggressive about getting the right tests ie, MRI etc.. FYI, my back pain was misdiagnosed as a back sprain. It wasn’t till 7 months later it was discovered as a compression fracture. Not fun, take care of yourself. Thanks for the advice. This is what I’m beginning to fear, that I may have done more than just pull a muscle. The fact that the pain has moved and located itself in one spot worries me a bit too. Here’s hoping I can get an appointment this week! I have read the Mary Norris book. I found it was more about her job than about grammar per se, but I found the decisions she had to make on the job really interesting. I agree it’s more about her job, but what’s fascinating about that in regards to grammar is how much and how often the experts disagree, or feel the need to exert control over the final product. I like her discussing the very delicate dance that can arise when she finds what she perceives as grammar issues in a writer’s work – did he/she mean it that way? or is it a genuine grammar mistake? So far I’ve found her grammar explanations fascinating, as well as clear and well-thought out. My back pain ended up being three problems: last vertebra is sitting on bone; two herniated discs; spondylosis or something. The vertebra in the spine are not line up, sort of off to one side. I am facing a three hour surgery and three units of blood. I am terrified. If I don’t have the surgery, I will lose control of bowels and bladder and be paralyzed from the waist down. If I had found this out sooner, the surgery would not leave me unable to walk after surgery. I will have to spend a month in rehab relearning how to walk. Since you are on top of this early, I am sure your problem can be fixed more easily. Good luck. Linda – first, I hope that you can get your back issues fixed in a way that leaves you mobile and without pain. After going through this episode I know that if your back hurts, it affects everything. The doctor said my issue was just nerves and muscles getting tangled up. Being on bedrest this past week, and taking the pain medication he prescribed has made a difference. I will start physical therapy on Monday and hopefully after a few sessions all will be OK again. This bout has been miserable though. I am so sorry for the late reply – I just discovered your message buried in the middle of a bunch of others. My error – I totally missed it when you posted.